I found this book when I was 12 on the shelves of the Science Fiction section at my school library. The original dust jacket featured no “blurbs” or description of what the book was about, but something about it intrigued me and I checked it out. 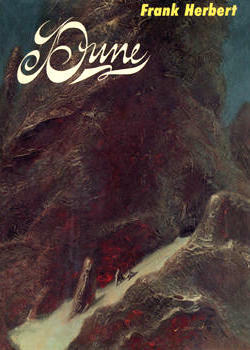 I’ve lost count of how many times I’ve read Dune – over a dozen by now, I am sure. When I first read this groundbreaking multi-faceted novel about consciousness, ecology, politics, religion, society – even love – I was enthralled and immediately went on to read the other two books in what was known at that time as the Dune trilogy: Dune Messiah (1969) and Children of Dune (1976). The first three books in the Dune series contain a continuity of characters and events, whereas the three books that follow – God Emperor of Dune (1981), Heretics of Dune (1984), and Chapterhouse: Dune (1985) are set in a future far removed from that of the original (already far-future) trilogy, and though they dwell on many of the same themes, largely embody a different society and set of characters. God Emperor of Dune is the link between the original trilogy and the last three books Herbert wrote in the series, the main character being one of the main characters from the original trilogy having become a god-like being no longer human in anything but memory. I have read Dune many times, and also I have read the original trilogy all-three-in-one-go probably half a dozen times. I don’t feel that the other three books are as strong, although I do have affection for God Emperor of Dune and have read it at least two or three times. I will state here – perhaps controversially – that I don’t really consider Herbert to be that great of a writer, as far as the actual writing of sentences, dialogue, and descriptions go. He is just sort of workaday – he gets the job done. Dune is just so brimming with brilliance in every other way that it doesn’t matter. I have read a number of his other books, all of which I enjoyed, but found none of them gripping enough to make me want to return to them. After Herbert’s death, his estate has gone on to release an extensive series of sequels, prequels, and other Dune books co-authored by Frank Herbert’s son Brian Herbert and Kevin J. Anderson. (I have not read any of these books.) You can learn about them on the official Dune website here. 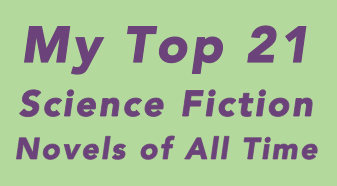 Dune is the best-selling Science Fiction novel of all time. It is also one of the most important ones, and probably a good place to start if you’ve never read SF before.